Yixing County, in the southern part of Jiangsu Province, has been the center of Chinese teapot production since the Song Dynasty (960-1279). 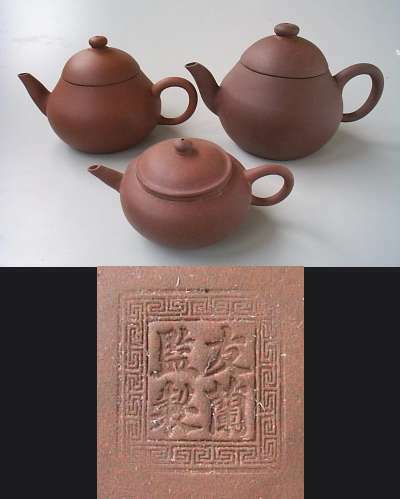 High quality Yixing clay comes from along the banks of Lake Tai near Nanjing. 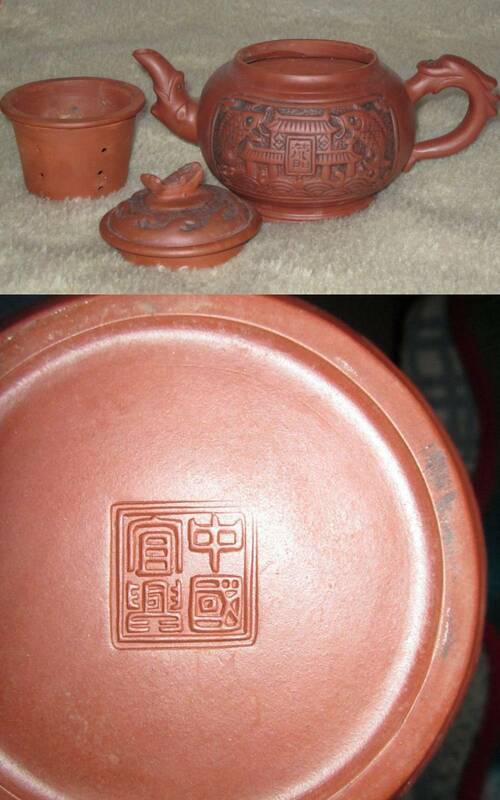 Refined and fired to a high temperature it produces a slightly absorbent pottery highly regarded by tea lovers. A good Yixing teapot should pour evenly from the pot, have a porcelaneous ring to it when struck, come with a very snug fitting lid and, if the lid has a ventilation hole in it, will stop pouring when you put your finger over it. Since the clay will absorb some of the aroma of the tea over the years, and thus enhance the flavor, it is important to drink only one kind of tea out of it. If the tea pot has any age to it, it should have a distinct residue of old tea inside. The clay used for Yixing pottery is called Zisha ("Purple clay") despite the fact that it is not always purple in color wether unfired or fired. The high content of metallic oxides in the clay body resulted in wares ranging from purple to beige or green, the variation in color being caused by differences in kiln temperature and atmosphere. This page has been created together with expert members of the Gotheborg Discussion Board. 1477. Mark: Zhong Guo Yixing (China Yixing). Characters in the decoration: Long Men (Dragon Gate). Modern, possible year 2000 or later. Symbolizing academic success as in passing the difficult examinations, as a carp manages to leap up-streams over the Lung Men (Dragon's Gate) waterfall, he would transform into a dragon. The full expression is Liyu Tiao Long Men and means that if a person works hard enough success will one day be achieved. 516. You Lan Jian Zhi - "You Lan ( Name ) supervised to make". On teapot found in "Straits" porcelain cargo outside Malacca, by Sten Sjöstrand. c. 1840. 538. Yixing pottery mark, Desaru cargo, c. 1840. On teapot found in "Straits" porcelain cargo outside Malacca, by Sten Sjöstrand. 539. Yixing pottery mark, Desaru cargo, c. 1840. On teapot found in "Straits" porcelain cargo outside Malacca, by Sten Sjöstrand. 540. Yixing pottery mark, Desaru cargo, c. 1840. On teapot found in "Straits" porcelain cargo outside Malacca, by Sten Sjöstrand. 541. Yixing pottery mark, Desaru cargo, c. 1840. On teapot found in "Straits" porcelain cargo outside Malacca, by Sten Sjöstrand. 542. Yixing pottery mark, Desaru cargo, c. 1840. On teapot found in "Straits" porcelain cargo outside Malacca, by Sten Sjöstrand. 543. Yixing pottery mark, Desaru cargo, c. 1840. Mark Tang Po where "Tang" is a surname and "po" an old woman, perhaps best translated as Old Lady Tang. On teapot found in "Straits" porcelain cargo outside Malacca, by Sten Sjöstrand. 544. Yixing pottery mark, Desaru cargo, c. 1840. On teapot found in "Straits" porcelain cargo outside Malacca, by Sten Sjöstrand. 545. Yixing pottery mark, Desaru cargo, c. 1840. On teapot found in "Straits" porcelain cargo outside Malacca, by Sten Sjöstrand. 546. Yixing pottery mark, Desaru cargo, c. 1840. On teapot found in "Straits" porcelain cargo outside Malacca, by Sten Sjöstrand. 547. Yixing pottery mark, Desaru cargo, c. 1840. On teapot found in "Straits" porcelain cargo outside Malacca, by Sten Sjöstrand. 548. Yixing pottery mark, Desaru cargo, c. 1840. On teapot found in "Straits" porcelain cargo outside Malacca, by Sten Sjöstrand. 549. 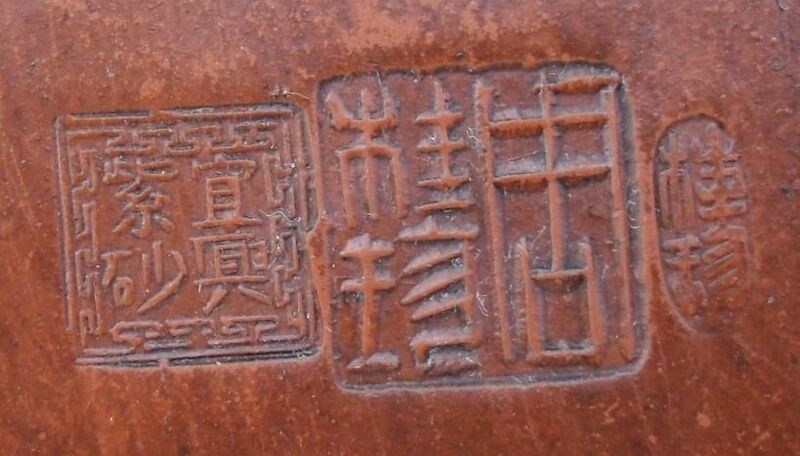 Yixing pottery mark, Desaru cargo, c. 1840. On teapot found in "Straits" porcelain cargo outside Malacca, by Sten Sjöstrand. 550. Yixing pottery mark, Desaru cargo, c. 1840. On teapot found in "Straits" porcelain cargo outside Malacca, by Sten Sjöstrand. 551. Yixing pottery mark, Desaru cargo, c. 1840. On teapot found in "Straits" porcelain cargo outside Malacca, by Sten Sjöstrand. 552. Yixing pottery mark, Desaru cargo, c. 1840. On teapot found in "Straits" porcelain cargo outside Malacca, by Sten Sjöstrand. 553. Yixing pottery mark, Desaru cargo, c. 1840. On teapot found in "Straits" porcelain cargo outside Malacca, by Sten Sjöstrand. 554. Yixing pottery mark, Desaru cargo, c. 1840. On teapot found in "Straits" porcelain cargo outside Malacca, by Sten Sjöstrand. 555. Yixing pottery mark, Desaru cargo, c. 1840. On teapot found in "Straits" porcelain cargo outside Malacca, by Sten Sjöstrand. 556. Yixing pottery mark, Desaru cargo, c. 1840. On teapot found in "Straits" porcelain cargo outside Malacca, by Sten Sjöstrand. 563. Yixing pottery mark. 20th century. 1501. Yixing pottery mark, saying "Yixing Purple Clay", contemporary, on a molded pottery teapot brushed with brown dressing to look old. 1213. Vase. Mark similar to Yixing pottery marks. Top seal means "Dragon Work Team Made". Bottom seal two characters are "Shou (long life) laugh/cry". It could mean 'long life' and 'always happy' or that smiling gives you a long life. Tentative date based on the piece's history c. 1960-80s. In an email of the 29th of January 2008, Carl Wantrup suggests that "this vase is in fact Japanese, and made at the Tokoname kilns. 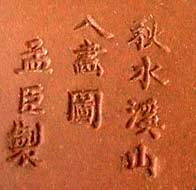 Tokoname is one of the oldest pottery production/kiln sites in Japan, and the clay body in Meiji Period Tokoname wares look very similar to Hongni (red clay) type Yixing wares, however this is to me quite clearly Meiji period Tokoname export ware, from a stylistic point of view. The most common design motif in Tokoname vases from this period was finely carved and incised dragons in low relief, amidst rough patterned clouds, and the vases were often given repeated stamped decoration as borders around the mouth and foot. Additional evidence for my proposal, is the fact that the shape of the vase is not a Chinese shape, but rather a Japanese shape", to which I am prepared to agree. This would clear up a long standing question mark about this type of ware.